No story today. In this case, truth is stranger than fiction. I’m a little bit horrified by this thing. Which isn’t to say it’s not good. It is. It’s rich and dense and very chocolatey. It’s cake, you guys- I don’t mean to sound like it ate my family or anything. We made a batch for the kids at the office- lined up a bunch of our company branded mugs and spooned in the ingredients, launched the microwave and then dropped them off at people’s desks. They ate them. They were pleased, very pleased, and amused by the novelty of it all. But I stood back and watched, not able to hide the horror on my face. There’s just something so… sad about chocolate cake for one. In a mug. So… not right. It should not be this easy to make your own cake in the microwave, for one thing. Maybe that’s what bothers me- how close I am to making chocolate cake. Every. Day. Just for myself. Just for myself in my apartment. Using my Sleepless in Seattle mug. Swarmed by cats as I dig in, all hunched over it, wrapped in a shawl I knit for myself. Plucking a stray piece of cat hair off my Chocolate Mug Cake for One. Feeling the thick cake hitting the bottom of my empty, loveless womb. Waiting for death. So, you know, ENJOY MAKING THIS RECIPE. Combine all ingredients in a large coffee mug (or 2). Whisk with fork until smooth. I actually had a mug of sadness last night, minus the nutella, which would probably have made it less sad…because then I would have just eaten the nutella out of the jar instead of lowering myself to eating the microwave quasi-cakelike substance I consumed out of laziness/desperation. i mixed pb xtra tbs of cocoa and xtra tbs of sugar than mixed that into the cake mix and did not add the nutella. You make me smile, lady! yummmmm. I want to try this! hahahaha your post is hilarious. especially the “So, you know, ENJOY MAKING THIS RECIPE.” part xD!!!! 😛 is there anything I can use to replace nutella? we’re out of it at the moment (and live a good forty minutes away from the grocery store). could i add peanut butter, perhaps? Can I replace cocoa powdr with milo powder? You can but I would knock back the sugar a bit, otherwise it might be crazy sweet. Great story and I love your pictures! We were literally at Home Depot yesterday trying to buy stuff to re-create a distressed/antiquey kind of wood surface like what you have in the photos. Thanks! We obviously wouldn’t have made it if it wasn’t for you guys. We’re in Chicago too- maybe we should set up a local bake sale with your lovely sister-in-law! Sadness Cakes for everyone! This looks danerous but so good! Shawls are hard to pull off, aren’t they? Especially when combined with cat hair. I showed my children how to make their own sad mug cakes. They loved the idea. Like a crazy science experiment. My 9 year old preferred the uncooked version and asked could she just eat it like that? Ewwwww. I promised to show her how to make chocolate mousse instead. Is there a substitute you can use for cocoa powder? Like nutella possibly? What a cute recipe!! I saw your recipe and immediately went to try it since I had the ingredients. I tried using less oil to cut the fat a little, but the cake turned out a little more brownie-like. I also cut 1 T of sugar and it still was awesome. So sad and so funny at the same time. Love it. Great blog!! Want to hear something even more pathetic? I’m the author of two books on single-serving microwave mug cakes. Not to hawk them here, but the first (featured on “The Rachael Ray Show”) contains 101 recipes for microwave mug cakes (and, no, they don’t all use cocoa powder, I’m pleased to report!) 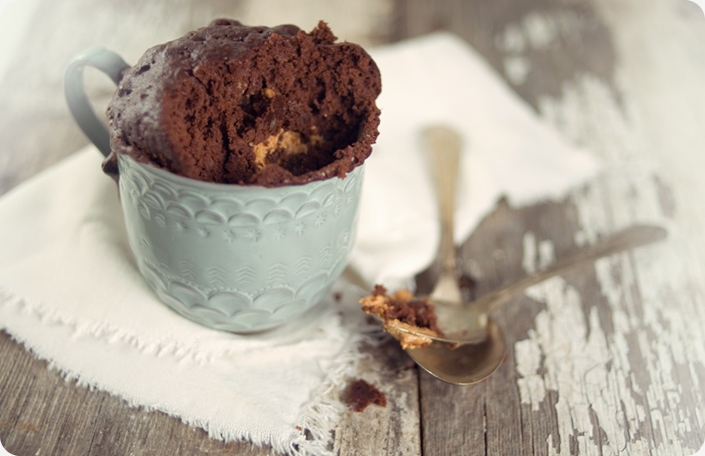 and the second contains 101 recipes for gluten-free microwave mug cakes. So, basically, I’ve spent about 2 years of my life inventing a total of 202 recipes for single-serving microwave mug cakes. Sad? Well…maybe. But I do love, love, love, love, love these recipes! To sample a couple of free microwave mug cake recipes, please visit my web site: http://www.microwavemugcakes.com. Click on the “Try One Yourself” link (in the last cloud, right above my photo). Enjoy! Stacey- wow! Well, clearly it’s not sad at all- look at how happy you’ve made all these healthy, well-adjusted people! Thanks for the laugh, you are very funny! And don’t fret, I’m a long married Mom and I too would be sitting around with my hand knitted shawl eating cake for one. I made this sans Nutella, and added a tablespoon of strawberry jam and some mini-marshmallows. Heaven! Hahah hilarious post. I can’t say I’ve ever made brownies in the microwave. Nor in a mug for that matter. Love the idea. Their “chocolate” is full of “flavinols” and “Dark chocolate” has actually been proven to be good for you! Made this last night…something (I’m assuming the egg) exploded ALL over my kitchen and face. Can we say ouch? It looks delicious though! I tried them! I love them! Easy to make and oh so great! Thanks for sharing! Surely it’s better to make just a single serving of cake than to make a whole cake that just sits there saying ‘eat me, eat me’… Unfortunately, I discovered these a couple of months ago and find that I make them far, far too often! I’m the exact same way. I have 200+ recipes bookmarked for “later” but I’m heading into the kitchen right now to make this! i made this last night. but mine turned out to be too hard..and while cooking, it rose above and almost spill out of the mug..what do i do? i used all the ingredients as directed. what made it turned out this way? anyone help! plsease.tq. I think each person’s microwave is different, I would try microwaving about 30 seconds less, stop and check it. It probably got too hard because it got overcooked- I had that problem the first time. You also can divide the batter into 2 mugs if it’s spilling over. Hope that helps! I LOVED this blog!! Laughing outloud all the way through! Thanks for great recipe and your wonderful writing style! OMG. I laughed out loud until I cried while reading the pre-amble to your recipe. Well done. You made my day, on many levels. OMG you are a genius, I am consuming now. I feel both incredibly depressed and insanely ecstatic, THANKYOU!!! I just tried this right after reading it.. it is good but a little gummy… add a little extra milk maybe and lots of hershey kisses to make it chocolate…thanks for sharing it..
I’m about to try this now. Where did you get the mug though? It’s absolutely beautiful. Does the recipe call for AP Flour or Self Rising/Cake Flour? 1150 calories a cup, for those who are wondering. 1300 if you drop in the PB. no we weren’t wondering… sometimes ignorance is bliss.. let us have our cake! I think it could be a bit sweeter. I just made it and besides the sweetness issue, I thought it was pretty good. No not sadness…gladness!! = ) followed the directions with the exception of i used 3 tbsp. of caramel instead of the nutella. YUMMY, my pullet eggs are perfect for this recipe. Thanks for sharing. My husband and I loved the story that went along with the cake and so had to try it. As I’m gluten free I substituted the flour for self-raising gluten free flour. Other than that I used everything in the recipe. It was so delicious! My husband didn’t even realise it was gluten free! I think we’re going to talk about a ‘cup of sadness’ as a euphemism for choclate around the kids from now on. Thank you so much for the recipe and the laugh! Here is the post on my blog with chocolatey photos! I just made these. They were gross. I might as well have just gotten a Kids Cuisine with the brownie that comes with that. Very bland. Wont be making these again, but nice try. My empty, loveless womb thanks you for the gift of chocolate… I’m going to go embroider a footstool with hand-dyed cat hair now. Wow, these are some beautiful photos. 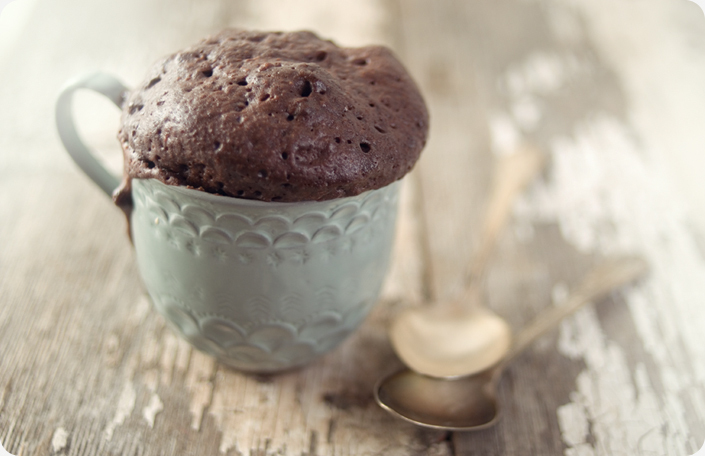 I’ve experimented with mug cakes a lot recently too – I think they’re wonderful! I’m really impressed with how you got the cake to puff out over the mug. can i replace the nutella with some icecream fudge? do you have to use self-rising flour? i used AP but they turned out hard (probably overcooked) and didnt rise :/ i saw in an earlier comment and you said that you just used AP but in the picture they look perfect and fluffy! help! i really want to perfect these!! First time I use my microwave for cooking cake but now i’ll do it again and again and again 🙂 ! I just made these with my brother because I was bored and had a chocolate craving. OMEHGOSH! THEY ARE AMAZING!!!! I altered the recipe a bit and made it in a souflee cup. thanks so much for sharing! Dezerty zo šálky: Tu sú tri jednoduché a úžasné recepty! 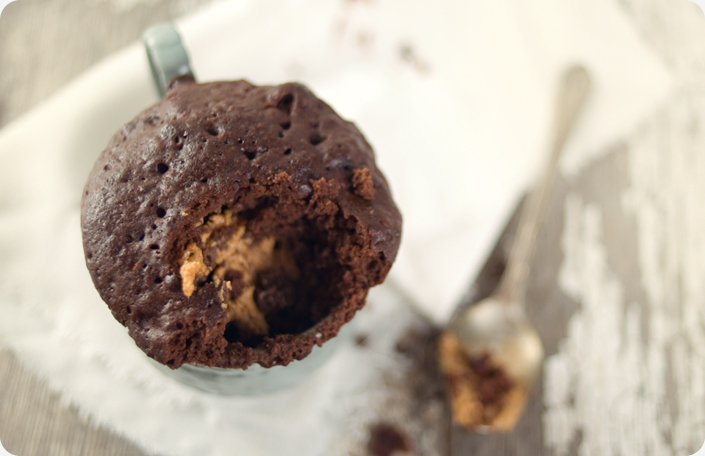 3 absolutely scrumptious desserts that can be made in a mug - Czaal is a source for deep thinkers, lifelong learners and truth seekers. Posts on science, self-improvement, psychology, unexplained mysteries.